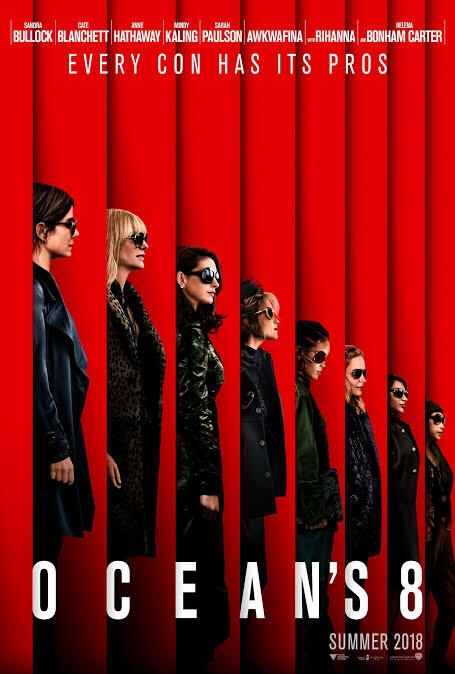 Now I’m no mathematician, but since the last film in the Ocean’s series was Ocean’s 13 (although technically it was the third movie) I would have thought that this should surely be Ocean’s 14. However, this isn’t a direct sequel to the slick George Clooney-fronted movie trilogy. Rather it is a spin-off, starring a stellar cast of some of the finest female talent around today. Bullock plays Debbie Ocean, sister of Clooney’s character, Danny. And it seems that a talent for grifting runs in the family. After spending over five years in jail, she finds herself paroled, and the first thing she does is proceed to organise a heist. Gathering a crew of fellow crafty con-women – each with a specific skillset – she plans to steal an extremely expensive Cartier diamond necklace from the annual exclusive invite-only Met Gala in New York’s Museum of Modern Art. Clearly not lacking in moxy, the team set about organising their daring robbery. However, Debbie also has an ulterior motive for the job, as she wants revenge on the person who framed her and sent her to jail in the first place. But her distracting secondary motive may end up costing the team the prize. This is super stylish. Just the fact that so much of it is set at the fashion-fest that is the Met Gala should tell you that. But it’s still not quite as slick and smooth as the offerings from Clooney and Co, although it does manage to look gorgeous throughout, and there are enough twists and turns to keep it engaging. The cast have a fantastic chemistry, and it is great to see a female-led caper, and one where the women don’t have to run to a man to solve something that goes wrong. Each character is smart, sassy, and confident in their abilities, and it makes for a winning combination. However, there are times where it mistakes its style for substance, and just coasts along. It never really peaks, or has that heightened OMG moment. Instead, it cruises at a steady pace, and while it is reliable, it is not very exciting. The actual scam itself is quite convoluted, and you will need to focus on exactly who is doing what and why. Despite this, it is entertaining – in a shallow sort of way. The assembled talent are all extremely engaging in their own right, and very watchable. While some of the ensemble scenes seem a bit clunky, on the whole they do a sterling job with the material. Also, it is fantastic to see such diversity in an ensemble cast. Not as clever as it thinks it is, but it should keep viewers engaged, and hopefully is the beginning of many more female-focused big screen offerings.